I would have liked for the author to expand on his statement that Paul’s gratitude for this church was related to his comments regarding the second coming of Christ later in the section. While this run on sentence is clearly intertwined, I would have loved for Mr. Paulien to have developed what he was thinking there. As I read the text it appeared clear to me (in the context of the New Testament and the ministry of the apostles) that Paul was compelled to thank God for the work He was doing in this church. Said another way, I do not see the words “ we ought to” as a type of social etiquette on par with thank-you cards, but rather as a statement of knowing God’s sovereign work in the lives of the church as well as an example of living in obedience to the command of scripture to thank God for His provisions (Phil. 4). It is important to remember that Paul wrote in Ephesians 2:8 that even faith is a gift from God. This gratitude appears to be related to God’s sustaining power for this church under heavy persecution. Simultaneously is the reality that the church is growing in God, by God’s power, and through their obedience to believe. Another piece of evidence for this conclusion is in the fact that Paul is clearly seeing an answer to his prayer for the church’s increase in love (1 Thess 3:6). Paul’s gratitude to our God and savior, the Lord Jesus Christ, is for His work of sustaining this church in the midst of great turmoil and confusion. The authors comments about Paul’s gratitude miss the opportunity to acknowledge God’s sovereign provision for the church and instead act as an admonishment to his readers to be certain that their faith is growing or it will die. As an Adventist this would have created great anxiety in me to work harder at spiritual disciplines (better Sabbath-keeping, devoted time to my SS lessons or reading EGW…etc.) so that I could grow my faith. However, a proper teaching of scripture reveals that God is both the author and finisher of our faith. We can look at this passage of scripture and know that He is faithful to His bride and that when we face spiritual confusion or persecution He will provide for us what we need to be sustained in the battle- even if we do not completely understand the battle we are fighting. God is sovereign even over our trials! A significant point to be made is that the purpose of Paul’s letter to this church is not to provide “significant criticism” of them as the author suggests he does, but to reassure them in their trials. The authors claim that Paul is significantly criticizing the church in the next chapter is completely unfounded. At the end of the letter he does admonish those who are not working and gives guidance to the church about how to deal with these people but the purpose of the letter was to reassure the church and provide them with sound doctrine and encouragement— not to criticize them! 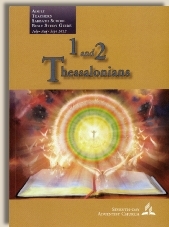 In concluding today’s lesson the author writes that, “The result of their increase in faith and love is that their fortitude in the face of affliction has become a source of boasting for the apostles… The Thessalonians have become a model of Christian commitment under fire.” It is quite difficult to know how to explain the theological differences between a Christian and a Seventh-day Adventist concerning the new birth, so addressing this comment comes with a big challenge. Christians do not see the new birth as a mental assent and commitment to the obedience of God’s law in order to vindicate His character. For the Christian, the Christian life is not about personal fortitude and determination. It is about the life of Christ indwelling us and sustaining us. Sometimes believers can forget that we have the Lord Jesus resurrection life dwelling within us, but when we walk through trials Jesus faithfully glorifies Himself to us in unspeakable ways. In these moments we long to boast in our weakness and share the powerful merciful work of God over and in our lives. I believe that Paul’s boasting was not about “Christian commitment under fire” but about God’s faithfulness evidenced in the unnatural response of the Thessolonian church amidst great turmoil. All glory goes to God, all the time. No one knew or taught that better than Paul, the pharisee of pharisees.